I had the opportunity to test brand new 1994 Suzuki Bravo in the middle 1994. The owner was one of my colleague (DS) that bought it new from the dealer. He asked me to test it because he was curious about the top speed of this motorbike. On a beautiful weekend night, together with a group of my colleagues that used to do on the road motorbike test. At that time, i rode a Yamaha Champ that had been stock-tuned and could reach 140 km/h on the long road in Jakarta (Gatot Soebroto Rd). Yeah, is only a straight road between Palmerah and Kuningan intersection, with approximately 2.5 km in length with no traffic light. FYI, until now, we don't have any speed limit in our country, so it's legal to speed up to the max. Then the time for me to test the bike was come. I checked the 2T oil level and put some of 2T oil directly to the gas, checked the tyres pressure. Finish with that small check routines, i was about ready to go. The stock carburettor jetting might be not too be tuned for the top speed, it was running too lean at the top speed. The engine itself was good performer, but the first gear was not build up for speed. The Brake was amazingly worst compare to Yamaha's bike. Stability is not that bad (up to 100 km/h). My colleague was happy about the results, than he asked me what small modification could he do to improve the performance. I recommend him: Carburetor Jetting, Racing muffler, Disk Brake. Two months after that test, he came back to me and showed me his bike. 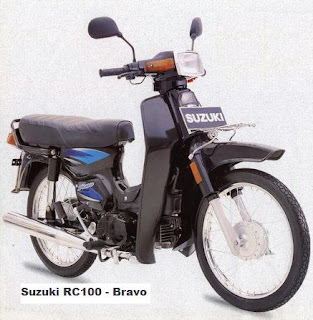 The bike had Suzuki Tornado GS muffler (still using the stock header), and it comes with the disk brake too. And he said he was happy with the bike after the modification. That modification made it run faster. I tested it back again in a short distance in Meruya, only about 600 metres straight road. That bike could reach up to 100 km/h in 500 metres, which signed a better power output and faster response. He told me that his jetting had been changed, he used #25 size for pilot jet, and many tests he had done, but the use of stock header made him accelerate better.